I just read that people in Cambodia eat rats that are sold on the market along with ‘mouth-watering’ recipes. They’re being advertised as ‘healthy’, stating that rats only eat grain. In history, there was a woman named Circe who owned a pig farm in the days of the greatest time of murder on earth, called the crusades. During this time, victims were accused of heresy or witchcraft. They were put in arenas where the audience had paid huge amounts of money to view a live show of these people being killed, literally ripped apart by lions or other beasts. The following excerpt is from archaeology.org. Emphasis and correction on the following article are mine. Many popular ideas about the Roman arena were formed in the nineteenth century from popular images and accounts. Movies from Quo Vadis to Gladiator have drawn on such works to depict a world of strangely armed gladiators, (people who followed Yahshua’s teachings) nobly awaiting attack by lions, and “thumbs down” death-gestures by emperors and rabid crowds. The roman armies were always a part of the pharisees, sadducees, essenes, and herodians who moved to Rome, changed their name to catholic and established the ‘holy’ roman empire and the roman catholic church. Protests by Romans against the games were rare (Seneca, Letters 7.2-5), and complaints … tended to focus on the low aspect of the entertainment rather than on the cruelty of the events. Far from being pitiful or horrifying, the image of an adult being thrown to the beasts was a reminder of an edifying entertainment. Roman scenes in different media show bloody attacks by lions and leopards against men propped up in the arms of animal-handlers, or tied to stakes in moveable carts. The image might have made a new, foreign slave wince as he cleaned the mosaic floor, and it might have caused him to think twice about running away. Nevertheless, it was clearly not intended to make those household slaves whose roles were well-established feel uncomfortably empathetic. Rather, it documented the brutal maintenance of social order and reinforced the solidarity of those who already belonged to that order. The arena played a significant role in Roman public life from the third century B.C. into the fifth century A.D., but the direct origin of gladiatorial games is somewhat obscure. (For this secret, you must go to mythology.) The earliest recorded Roman examples were hand-to-hand combats, probably involving captives, performed at funerary games at Rome. From these relatively modest beginnings the games grew and grew. By the late Republic the full political potential of gladiatorial and other shows was increasingly exploited. A show, munus, was paid for by a munerarius or editor to fulfill his civic and religious duties (to destroy any and all worshippers who tried to teach or practice the Laws of Yahweh) and illustrate his wealth and social or political status. Games were no longer produced just for funerals and memorials, but also for birthdays, dedications, inaugurations, victories, and other occasions. Munerarii expended vast sums on exhibitions pitting men and beasts against one another in various combinations. The presentation of games and beast-fights spread throughout the empire. New cities included amphitheaters among their public buildings, while older cities added them or made do with existing structures or temporary wooden ones. Audiences represented all members of society, and artists and craftsmen created images of the arena suitable for all social classes. …served as souvenirs and mementos of executions, beast-fighting, and gladiatorial combats. 2 And he killed Yaaqob the brother of Yahchanan with the sword. 4 And when he had apprehended him, he put him in prison, and gave command for four details of four soldiers each to guard him; intending to bring him before the people after Passover. The church, the roman catholic church and its army (Daniyl 11:31) murdered those who taught or practiced Yahweh’s Laws of Righteousness, known as the House of Yahweh. The crusades were, and still are, against every form of Holiness, which is the Righteousness of Yahweh. In Greek mythology, Circe (/’s3rsI:/; Greek Κίρκη Kírkē pronounced [kirkee]) was a goddess of magic (or sometimes a nymph, witch, enchantress or sorceress). By most accounts, Circe was the daughter of Helios, the God of the sun, and Perse, an Oceanid. Her brothers were Aeetes, the keeper of the Golden Fleece, and Perses. Her sister was Pasiphae, the wife of King Minos and mother of the Minotaur. Other accounts make her the daughter of Hecate, the goddess of witchcraft herself. Webster says the English word “church” comes from the Greek word kuriakon meaning “the Lord’s” or “the Lord’s house or belonging“. Judaica, Volume 7, gives us the following information about the Name Yahweh being removed and replaced with lord. YHWH. The personal name of the God of Israel is written in the Hebrew Bible with the four consonants yhwh and is referred to as the “Tetragrammaton”. At least until the destruction of the First Temple in 586 b.c.e., this name was regularly pronounced with its proper vowels, as is clear from the *Lachish Letters, written shortly before that date. But at least by the third century b.c.e., the pronunciation of the name yhwh was avoided, and Adonai, “the Lord”, was substituted for it, as evidenced by the use of the Greek word Kyrios, “Lord”, for yhwh in the Septuagint, the translation of the Hebrew Scriptures that was begun by Greek-speaking Jews in that century. Where the combined form ’Adonai yhwh occurs in the Bible, this was read as ’Adonai ’Elohim, “Lord God”. The Encyclopedia Britanica, Volume 23, page 867, confirms the fact that the proper, original Name Yahweh was replaced with common substitutes. The name Yahweh later ceased to be used by the Jews for two somewhat contradictory reasons. As Judaism began to become a universal religion, the proper name Yahweh tended to be replaced by the common noun Elohim, meaning “God,” which could apply to foreign deities and therefore could be used to demonstrate the universal sovereignty of Israel’s God over all others. At the same time, the divine name was increasingly regarded as too sacred to be uttered, for fear of profanation, and in the synagogue ritual it was replaced by Adonai (“my Lord”), which was translated Kyrios (“Lord”) in the Septuagint. The Catechism of the Catholic Church also confirms this fact. The term arena, signifying the place of combat, is derived from arena or harena, the sand sprinkled on the fighting field to soak up blood and facilitate cleaning. Although the amphitheater was developed as the special space for gladiatorial events, it was not the first or only site for them. Fora (public squares) and circuses (venues for chariot-racing) were used first. A theater and stadium could also served, in the absence of an amphitheater or circus, as a site for arena games, especially in Greece and the east. Beast-hunts were often presented in circuses (or in stadia and hippodromes in the Greek world) until the seventh century A.D. The seating area around the long, open field of a small circus or stadium was not necessarily larger than that around the open area of a forum. A larger circus, however, could seat as many as 100,000 viewers (the Circus Maximus in Rome may have held as many as 250,000)… In circuses, organizers spaced combatants and animal hunts throughout the field so that everyone would have something to watch. When a munerarius could afford it, he tantalized the crowd with shows exotic and large in scale as well as violent and bloody. …nothing could match the shows put on in Rome by an emperor. The populace was regularly treated to a variety of entertainments, and Romans became blasé. In the first century B.C., Cicero, who thought there was nothing especially appealing about watching a human being mangled by a more powerful animal, was not horrified by the idea, but bored of it. Even if it was supposed to be exciting, he said, there was nothing new in it (Letters to Friends 7.1.3). Second, the arena served as a place of dramatic public execution in the form of such tortures as crux (crucifixion), crematio or vivicomburium (burning alive), or damnatio ad bestias (throwing people to the beasts). The people executed publicly were usually criminals, prisoners of war, deserters from the army, and other troublemakers and outcasts (such as slaves who had run away, or (believers in Yahweh and Yahshua) who would not offer a sacrifice to the Gods of the state or to the emperor). They were treated as no better than animals… Tacitus comments on the negative reaction when Nero (A.D. 54-68) punished (followers of Yahshua who taught and kept Yahweh’s Laws) seemingly out of cruelty rather than for the public good (Tacitus, Annals 15.44). Caligula (A.D. 37-41) was known for forcing anyone he did not like into the ring, including spectators who annoyed him (Dio Cassius 59.10, 13-14). Hundreds of thousands of lives were lost in Roman arenas, including the Colosseum. Not just the gladiators but also helpless men, women and children of all ages who were sentenced to die in the Roman Executions at the Colosseum. The vicious and cruel Romans delighted in even more novel ways of executing Christian Martyrs. The Emperor Nero introduced twilight executions where hapless Christians were nailed to the cross and burned alive as torches to light the arena of the Colosseum. Others were thrown to wild animals. Rome was a warrior state. After the defeat of Carthage in 201 BC, Rome embarked on two centuries of almost continuous imperial expansion. By the end of this period, Rome controlled the whole of the Mediterranean basin and much of north-western Europe. The discipline of the Roman army was notorious. Decimation is one index of its severity. Roman soldiers killed each other for their common good. When Romans were so unmerciful to each other, what mercy could prisoners of war expect? Small wonder then that they were sometimes forced to fight in gladiatorial contests, or were thrown to wild beasts for popular entertainment. Public executions helped inculcate valour and fear in the men, women and children left at home. Children learnt the lesson of what happened to soldiers who were defeated. Public executions were rituals which helped maintain an atmosphere of violence, even in times of peace. Bloodshed and slaughter joined military glory and conquest as central elements in Roman culture. The enormous size of the amphitheatres indicates how popular these exhibitions were. The Colosseum was dedicated in AD 80 with 100 days of games. One day 3,000 men fought; on another 9,000 animals were killed. It seated 50,000 people. It is still one of Rome’s most impressive buildings, a magnificent feat of engineering and design. In ancient times, amphitheatres must have towered over cities, much as cathedrals towered over medieval towns. Public killings of men and animals were a Roman rite, with overtones of religious sacrifice, legitimated by the myth that gladiatorial shows inspired the populace with ‘a glory in wounds and a contempt of death’. The lions would only eat so much and then eat no more for days, but they would kill. So what were they to do with the ravaged bodies that the beasts could not eat? Give them to Circe. Who is Circe? Circe is where the word church comes from. The following excerpts give us some insight. Our common dictionaries, however, are honest in revealing to us the true origin. They all trace the word back to its Old English or Anglo-Saxon root, namely circe. And the origin of circe? Any encyclopaedia or dictionary of mythology will reveal who Circe was. She was the goddess-daughter of Helios, the Sun-deity! Again, another form of Sun-worship, this time the daughter of the Sun-deity had become mixed with the Messianic Faith. Tyndale, who translated the first “New Testament” printed into English (1525-56), did not use “church”, but rather “congregation”. He did use the word “churches”, though, but only once, when referring to pagan temples (Ma’aseh/Acts 19:37). The Old English word was CIRICE, and you will see it spelled CHIRCHE written above many old “church” entrances throughout England. This is from the West Germanic KIRIKA, which is based on the Greek deity’s name, CIRCE. Swine will eat a dead person? History is chocked-full of cases where farmers die while feeding their swine and only parts of their bodies were found later. Back in the 40s on the south side of Purcell, Oklahoma, a man named Jody Sparlin owned a pig farm. He had a wench truck that he would use to pick up dead cows, horses, and swine from other farms because the farmers didn’t want to bury them. Anything he dumped in the pig pen was readily consumed by the pigs. Even dead dogs, cats and other pigs were eaten. The fat swine were then sold on the meat market. Terry Garner went out to feed his swine — and they feasted on him instead, authorities say. A forensic expert at the University of Oregon will try to determine what exactly killed him. A family member of an Oregon pig farmer discovered his relative’s body parts scattered across the pen — a gruesome find leaving authorities to believe it was a case of hog eats human. A pathologist couldn’t immediately determine whether the pigs were the actual cause of 70-year-old Terry Garner’s death, but a forensic expert at the University of Oregon will conduct further tests, CBS affiliate KCBY reported Monday. Garner’s dentures were first spotted inside the hog enclosure, and then other random body parts were located — although most of him had already been devoured, the newspaper added. The Coos County Sheriff’s Office has a couple of theories on what occurred: Garner could have suffered a medical emergency, such as a heart attack, leaving him in “a position where the hogs could consume him,” according to a statement. The 56-year-old wife of a pig farmer in Romania was knocked unconscious and eaten in the animals’ sty, UPI reported in 2004. Circe did the arenas a big favor, during their ‘holy’ gatherings, by taking away the dead carcasses of those wretched people who were not worthy to bury. What the lions could not eat, the pigs were given with great honor. The beloved goddess Circe or church, it’s said, turned her enemies into swine, then ate the swine. She probably died of trichinosis. I first learned about trichinae from the fourth grade health books in school. They said to be sure to cook pork well-done before eating it, or dying you will die. That’s close enough to what the health book said. It’s close to what Yahweh told Adam in the beginning when Yahweh put His Laws in front of Adam and Eve. Trichinella spiralis is a parasitic nematode (roundworm) which is found in many warm-blooded carnivores and omnivores, including pigs. Trichinella has a direct life cycle, which means it completes all stages of development in one host. Transmission from one host to another host can only occur by ingestion of muscle tissue which is infected with the encysted larval stage of the parasite. When ingested, muscle larvae excyst and enter tissues of the small intestine, where they undergo development to the adult stage. Male and female adult parasites mate and produce newborn larvae which leave the intestine and migrate, through the circulatory system, to striated muscle tissue. There, they penetrate a muscle cell, modify it to become a unique cyst, and mature to become infective for another host. The total time required for this development is from 17 to 21 days. Adult worms continue to produce larvae in pigs for several weeks before they are expelled. Once adult worms are expelled and larvae reach and encyst in musculature, no further contamination can occur. Trichinella spiralis has a long standing association with pork products, not only in the U.S. but around the world. The concept which many people have about the need to cook pork thoroughly is based on the risk of becoming infected with this parasite. This concern is well founded in history. At the beginning of the 20th century conservative estimates showed a 2.5% infection rate in U.S. pigs. Even more alarming were postmortem surveys, conducted in the 1930’s. A National Institute of Health report published in 1943 found 16.2% of the U.S. population to be infected (1 out of every 6 people). This type of information led to considerable publicity on the dangers of eating pork. 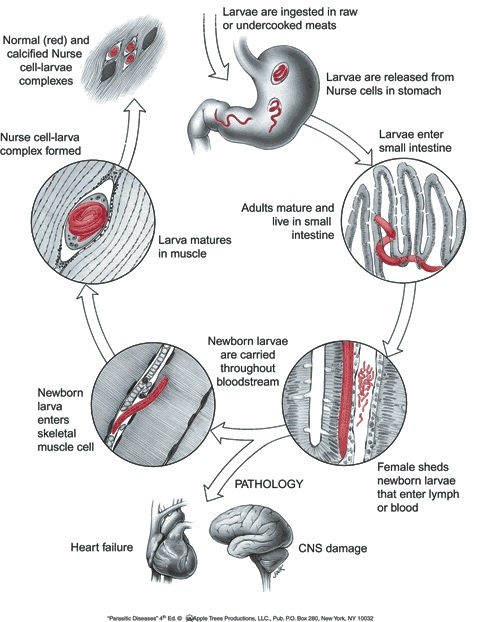 This illustration from trichinella.org shows the cycle of the trichinae larvae. Did you notice, they invade your blood vessels? Knowing these things about swine and trichinae, why would anyone break the Laws that Yahweh put in their bibles to warn them about sickness, disease, death, and even eternal death? Isayah, the Great Prophet of Yahweh, gives the answer. They follow the priests who eat swine, in obedience to Satan whose desire is to persuade all of mankind to be evil like the Gods. Read it for yourself. Following the priests who eat swine, which fills their bodies with sickness and disease. Now read the Law that warns about the defilement that comes from breaking this Law. Those who eat pork (pig, swine), which is almost the whole world, are following the priests who teaches eating pork is acceptable in rebellion against Yahweh’s Laws. These priests present themselves as ‘holy’, which they are not. Notice the location of the church that brings; that is, teaches abominations to the whole world. In verse 2, notice the people are rebellious because they follow rebellious priest. They are as their teachers. In verse 4, we see they eat swine’s flesh and it’s in their vessels; that is, blood vessels. Remember, the article you just read and the fourth grade health book show how the trichinae gets into the vessels. Let’s look at the illustration again. Also in Isayah 65:4, we see the word abominable. The Hebrew word that is translated as abomination means you are sick. The Hebrew word that is translated as abominable means you are sick and can pass that sickness on to others. Everyone on earth is sick at this time. Every baby is born with one or more defects that were passed to them from either their parents, grandparents, great grandparents, or great, great grandparents—to the third and fourth generation. Every person born today adds more abominations to those acquired from their ancestors because they follow the same system that was set up by their forefathers. The FDA (Food and Drug Administration) does not consider the Wisdom in their bibles in the decisions they make to allow trichinae infested pork or horse meat to be placed in the same freezer units as beef, chicken, or lamb. Don’t touch signifies danger in touching. Touching the carcass or parts of the carcass of an unclean animal can give a person an infection that could take their life. Have you noticed the increase in deaths from pain pills? They say overdosing is the cause. Poisoning would be a better word. Here is a person who has an infection, possibly from something they ate or touched, that is so painful they can hardly bare it, then they add more poison to their bodies trying to ease the pain. Then, the heart, lungs, kidneys or whatever organ trichinae may have set up home in can’t take the double poisoning so it shuts down. Their meat you shall not eat, and their carcasses you shall not touch. They are unclean to you. In Revelation 18:4, Yahweh says to come out of her My People. Mythology is taking a true story and turning it into a myth. St. Nick is a great example of mythology. He was a priest who made candy to give to children. In mythology, he is a God called Santa Claus, a very fat, very gray old man who makes toys for children, or whoever. He rides in a sleigh pulled by reindeer that can fly to every home in the world on the same night. He then enters the home through an eight inch stove pipe (chimney), never through the door. If you can come up with any more lies to add to these, you have become a mythologist. Halloween, also called all saints day, all ghosts day, all goblins day, with trick or treating came from the worship of the dead in early Egypt. This worship was brought into Israyl by rebellious elders who became known as pharisees, sadducees, essenes, and herodians during the time of Yahshua Messiah’s Work on earth. This same group, along with their roman army, move to the seven hills of Rome. From there, they sent their army, led by general Titus, to destroy the temple in Yerusalem and to bring the temple artifacts back to Rome. In Rome, they changed their name again. Now, they call themselves catholic, meaning universal, which means they worship all Gods. Ask the question, who built Rome, and the only answer you will get concerning the great secret of where the pharisees, sadducees, essenes, and herodians went is a myth. Notice what their mythologists put out to hide the truth. Capitoline Wolf. 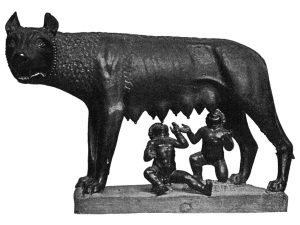 Traditional scholarship says the wolf-figure is Etruscan, 5th century BC, with figures of Romulus and Remus added in the 15th century AD by Antionia Pollaiuolo. Recent studies suggest that the wolf may be a medieval sculpture dating from the 13th century AD. While Romulus wanted to found the new city on the Palatine Hill, Remus preferred the Aventine Hill. They agree to determine the site through augury but when each claims the results in his own favor, they quarrel and Remus is killed. Romulus founds the new city, names it Rome, after himself, and creates its first legions and senate. The new city grows rapidly, swelled by landless refugees; as most of these are male, and unmarried, Romulus arranges the abduction of women from the neighboring Sabines. The ensuing war ends with the joining of Sabines and Romans as one Roman people. Thanks to divine favour and Romulus’ inspired leadership, Rome becomes a dominant force, but Romulus himself becomes increasingly autocratic, and disappears or dies in mysterious circumstances. In later forms of the myth, he ascends to heaven, and is identified with Quirinus, the divine personification of the Roman people. Possible historical bases for the broad mythological narrative remain unclear and disputed. Why will they not reveal the true history of Rome? It’s too belittling. They do not want you to know that they are the pharisees, sadducees, essenes, and herodians who rebelled against Yahweh and took the temple (House of Yahweh) violently by force because they hated Yahweh, Yahshua, and the Righteousness of Yahweh as shown by Yahshua Messiah. How would they possibly explain the millions, some say billions, of people they killed for only one reason…they would not worship their Gods? Notice in Mattithyah 11:12, violent men; that would be the pharisees, sadducees, essenes, herodians and their roman army. They wanted to murder Yahshua because He taught Yahweh’s Laws. Sin is all that is brought forth by the churches today. None of them practice Yahweh’s Laws of Righteousness. They murdered Yahshua. Then they moved some of the temple artifacts to Rome where they had already headquartered themselves. Later, they had the temple destroyed and the remaining artifacts moved to Rome. Notice the history of Titus seizing the temple. The fact is, the jews of yester-years, who persecuted Yahweh’s Prophets, murdered Yahshua Messiah, eleven of His twelve Disciples and millions of others, removed the Names Yahweh and Yahshua from the Inspired Scriptures before allowing them to be printed as the King James Version, are the so-called catholics and christians of today. Because of myths, we see a totally deceived world. Like Saint Nicholas, who became the God Santa Claus, who supposedly comes down the chimney of every home on the birth date (December 25) of the sun God baal or lord, Circe the pig farmer, who hulled-off the remains of the ‘heretics’, killed by lions, to her farm where they were turned into swine’s flesh and sold on the market to be eaten by those who bought it, through mythology, became Circe the Goddess. The information about Circe, later presented in this letter, is part truth and part mythology. Keep in mind that mythology is taking a portion of true history or of a person’s life and exaggerating it to make people believe lies. The truth is obvious, but to hide the truth, lies must be told, and there are plenty told. When people find out that horse, swine, dog, or rat meat are being sold along side of their choice of meat in the freezer or packaged in their canned food products, they get upset. Then the representatives, whom they pay dearly in Washington, or shall we say, Caesar’s palace or the roman empire, start stretching the truth (lying) to cover up their obvious blunders. What’s worse is that history is written, and rewritten, to hide the facts that can’t be thrown away. Who established Rome and the Vatican? Who put all those Gods up around ‘St. Peter’s’ Square? Who is St. Peter, whom they say is the Apostle Peter, whose true name was Kepha? Why did they change his name? Who murdered eleven of the twelve Disciples, many of them in Rome? Who rapes and sodomizes children? Who isn’t repenting and converting? What does mythology say to cover that evil of the Gods? Did you notice, be like the Gods practicing evil? Now back to Circe (church) the pig farmer. Circe was renowned for her vast knowledge of potions and herbs (drugs; she still is – Revelation 9:20-21). Through the use of magical potions and a wand or a staff, she transformed her enemies, or those who offended her, into animals. There is no power in magic wands or magical potions. Did you notice that kuriaka (church) signifies the Lord’s day? If you think that’s the Fourth Commandment, you are wrong. Check me out. Constantine gave the command that the catholic church celebrate the Lord’s day and reject Yahweh’s Commandments in spite of what’s stated in the Holy Scriptures—Exodus 20:8-11, Yaaqob 2:10-12, Mattithyah 19:17, I Yahchanan 3:4, 7-8, 10, Hebrews 4:8-11, Revelation 22:12-14. Know this, church or Circe, the pig farmer, existed in Israyl as did the lion arenas. Many of the structures are still there, as well as in Rome, for all to see, with historical markers showing that millions of men were killed by lions, wolves, and other wild animals. These actions were against Yahweh’s People—those who taught and practiced His Laws. For more information about the persecution and killing of Yahweh’s People, get our book, The Lost Faith of the Apostles and Prophets. For an in-depth study of the removal of the Names Yahweh and Yahshua from the Holy Scriptures call, write, or email us and inquire about our publications The Name Above All Names and In Search of a Savior. The same system that removed the Names of Yahweh and Yahshua from the Holy Scriptures also changed the Seventh Day Sabbath to Sunday, the first day of the week. Bible Readings for the Home gives us the following information. NOTE__”The Pope is of so great authority and power that he can modify, explain, or interpret even divine laws…The Pope can modify divine law, since his power is not of man, but of God; and he acts as vicegerent of God upon earth.” Translated from Lucius Ferraris, Prompta Bibliotheca (Ready Library), “Papa,’’ art. 2. “It [the Roman Catholic Church] reversed the Fourth Commandment by doing away with the Sabbath of God’s word, and instituting Sunday as a holiday.” N. Summerbell, History of the Christian Church (1873), pg. 415. For years, those who hate what Yahweh’s Name stands for, which is His 613 Perfect Laws, have tried to falsify Yahweh’s Laws and remove His Name from the entire Scriptures. I would like to bring two Scriptures to your attention. The first one is the famous 23rd Psalm. Notice first the King James Version. 2 He maketh me to lie down in green pastures, he leadeth me beside the still waters. 4 Yea, though I walk through the valley of the shadow of death, I will fear no evil: for thou art with me; thy rod and thy staff thy comfort me. Now notice what the Hebrew actually states in The New International Version Interlinear Hebrew-English Old Testament by John Kohlenberger III. 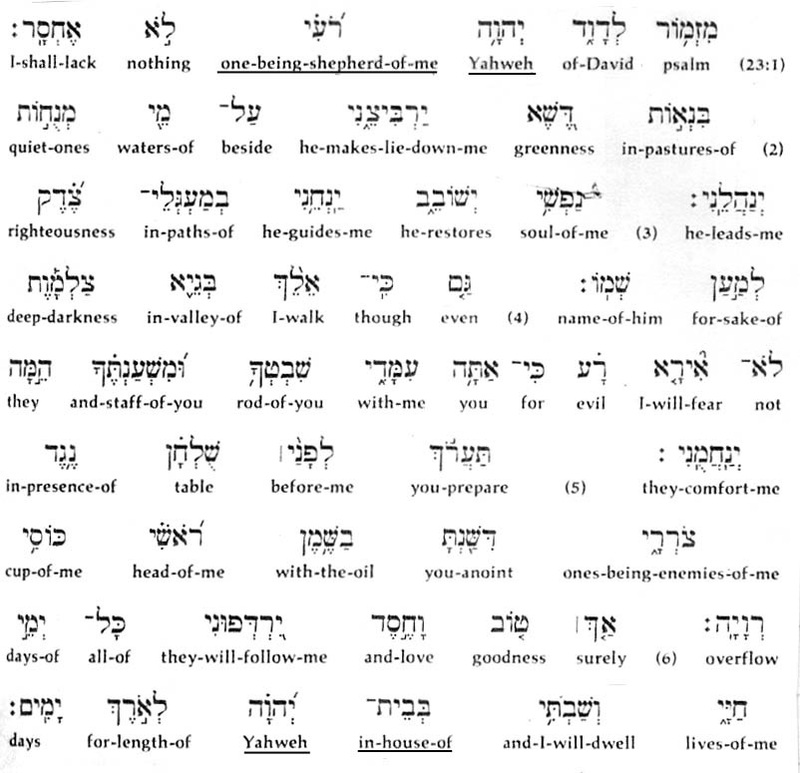 Hebrew reads from right to left. This shows plainly the Name by which Yahweh’s Work was known, and will be known throughout all eternity. The following excerpt was taken from an article in the November/December 1997 issue of Biblical Archaeology Review, pages 28-32. We see here that the Creator’s Work during the time of Solomon was known by the same Name as it is today—The House of Yahweh. It was Solomon who built The House of Yahweh where this tithe was given. You can read of this in I Kings 6. Two extremely important Hebrew inscriptions have recently surfaced on the antiquities market. One appears to be a receipt for a donation of three silver shekels to the House of Yahweh, pursuant to an order of the Israelite king. This is the oldest extra-Biblical mention of King Solomon’s Temple ever discovered. The other inscription records the petition of a widow for some portion of her late husband’s property. Both inscriptions, apparently by the same scribe, are written in Old Hebrew, or paleo-Hebrew, the script used before the Babylonian Exile. Both are on pieces of pottery, called ostraca because they bear an inscription. The text on the first ostracon, which measures about 4 inches wide by 3.5 inches tall (10.9 by 8.6 cm), is only 5 lines and 13 words long. All the words are complete and readable. See the box for the text and translation. *Brackets indicate that the letter or word has been reconstructed. Half-brackets indicate that part of the leter or word has been reconstructed. The Temple is designated by the Hebrew term BYT YHWH, many times in the Bible. (Temple only refers to the building, Beit—House refers also to the people of Yahweh). But BYT YHWH had been found complete in only one extra-Biblical inscription, a faded ostracon from Arad with an obscure context, until this newly published ostracon was revealed. BYT YHWH has been reconstructed on the inscribed ivory pomegranate that served as the head of a priestly scepter in Solomon’s Temple… divine name would mean “he causes to be, or exist,” i.e., “he creates.” Amorite personal names after 2,000 B.C. lend support to the Haupt-Albright view, demonstrating that the employment of the causative stem yahwe “he creates” was in vogue in the linguistic background of early Hebrew. Call, write or email and request our booklet, The House of Yahweh Established, for more information on this subject. The Prophets of Yahweh show a Work that Yahweh will do in this Last Generation that will not be devoured by Satan. These are wonderful Prophecies that everyone needs to be aware of in this generation, because this Work is prophesied to bring Salvation in this generation. Notice the Work. This is Yahweh’s last warning to the rebellious religions that teach the whole world–all nations–to sin. This Work is spoken of by almost all of the Prophets in your bible. Yet, few ever discover more than the Prophecy in Revelation Chapter 11. Yahweh’s Plan to build a Kingdom of Priests started with Yahshua Messiah, Who, by upholding the Righteousness of Yahweh, became the High Priest over the Last Days’ Prophesied Work of Yahweh. 5 For example, to which of the malakim did He ever say: You are My Son, today, I have become your Father? And again: I Myself shall become His Father, and He Himself will become My Son? 6 But when He again brings His Firstborn into the inhabited world, He says: Let all the malakim of Yahweh worship Him. 7 Now of the malakim He says: Who makes His malakim spirits, and His ministers a flame of fire. Yahshua upheld, taught, and practiced Yahweh’s Laws, even in the face of death, giving the True Seventh Day Sabbath rest to Yahweh’s People. He showed the pharisees, sadducees, essenes, and herodians their sins, using the very Laws they hated; they also hated and murdered Yahshua. Yahshua taught and kept the Seventh Day Sabbath according to the written Laws, summarized in the Ten Commandments. Yahshua is now guiding The House of Yahweh as the High Priest over The House of Yahweh. What is Yahshua now guiding His House to teach? Not mythology. Not Circe. Not church. Not pig farming. Billions of people eat unclean foods that are causing sickness, disease and death in this generation, and they don’t even know it. The House of Yahweh was established in this generation according to Yahweh’s Prophecies and is teaching Yahweh’s Laws of Righteousness, the only way to Salvation. The only way to peace. The only way to health. Yahweh’s People are gathering now. Read about it in the news, online, or in the Inspired Holy Scriptures. Another Prophecy coming to pass as I write. Those left alive by the Protection of Yahweh will be keeping the Appointments set by Yahweh–Yahweh’s Feasts–that were taken away from the world by the pharisees, sadducees, essenes, and herodians. They moved to Rome, changed their name to catholic, and had their roman army destroy The House of Yahweh, and move all of its artifacts to Rome. This time, the gates of hell will not prevail! And I also say to you who are Kepha; whose name means “rock”: That upon this Rock, YAHWEH UNITY; I will build this house; family: The House of Yahweh, and the gates of sheol (hell); the grave, will not prevail against it. Previous Post The Whole World is Sick…Why? What Hope is Available? Yahweh’s Health Laws are Better than All Drugs Next Post What Could Take the Place of Wars?